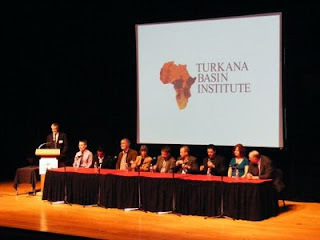 The symposium ended with questions and issues for discussion by Richard Leakey. Then, the floor was opened for general Q&A session with the panel. “Accepting it (Homo floresiensis) will require us to rewrite the textbooks.” – William Jungers, Stony Brook University. “Hobbits in context: life, times and death of Homo floresiensis” by Michael J. Morwood, University of Wollongong, Australia. “Digging up Hobbits: The Excavations at Liang Bua” by Thomas Sutikna, National Research and Development Centre for Archaeology, Indonesia. “Stone Tools and Hominins on Flores” by Mark Moore, University of New England, Australia. “Whence Homo floresiensis? Clues from the brain.” by Dean Falk, Florida State University. “Her Teeth Were Sharp, Her Gums Were Raw, and Spit Was Dripping From Her Jaw: The Little Things That Make Us Human” by Peter Brown, University of New England, Australia. “Why the Tiny Wrist Bones of a Hobbit Tell Us So Much About a Big Chapter in Human Evolutionary Theory” by Matthew Tocheri, Smithsonian Institution. “The Hobbit Shrugged: The Shoulder of Homo floresiensis and its Implications For Human Evolution.” by Susan Larson, Stony Brook University. “Can Island Dwarfing Explain Hobbit Body Size and Shape?” by William Jungers, Stony Brook University. “Virtual Hobbits and Health in Homo floresiensis” by Charles Hildebolt, Washington University in St. Louis. We don’t have Homo erectus feet in our fossil record. The fossilized foot prints that were found in Ileret, Kenya has been suggested that it was left behind by Homo ergaster, an earlier version of Homo erectus.